In most applications, gauge pressure measurement is required and therefore pressure sensors and pressure transmitters that measure pressure against the prevailing ambient pressure are commonly used for this. Those pressure sensors typically have a venting hole to allow the ambient/gauge pressure to act upon the back end of the sensor element. Electronic pressure sensors usually measure the change in pressure through the deformation of a diaphragm. If this diaphragm is exposed to the process pressure on one side and “vented” on the other side (and thus exposed to the ambient pressure), the deformation is reduced by exactly this ambient pressure. Therefore, the measuring result is a pressure difference between the measured process pressure and the currently present ambient pressure. This ambient/gauge pressure may fluctuate with a value up to +/- 30 mbar due to the actual weather conditions, and up to 200 mbar as a result of the location (pressure difference between sea level and 2,000 m). In applications where a harsh set of working conditions exist (such as water jet cutting), “unvented” or “sealed” pressure sensors are used, i.e. the case of those pressure sensors is sealed during manufacturing. Typical applications are high pressure applications in mobile hydraulics or similar fields, where a pressure range of 400 bar and more is typical. If in such cases one uses a sealed (or “unvented”) pressure sensor to increase it’s reliability under such adverse conditions, the question arises, how this influences the measuring result. 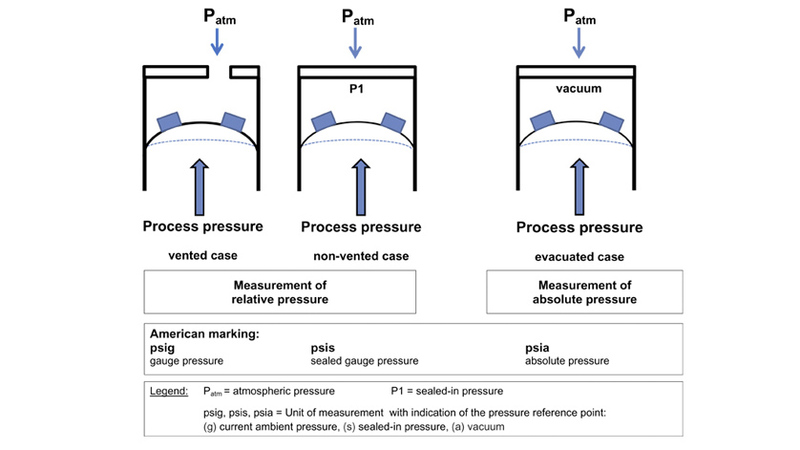 Since, at such high pressure ranges, the fluctuations in ambient/gauge pressure compared with the process pressure are negligibly small (as we learned above they stay within +/- 230 mbar), it is not important what the atmospheric pressure is and whether the case is sealed or not. The influence of ambient/gauge pressure on the measuring accuracy e.g. 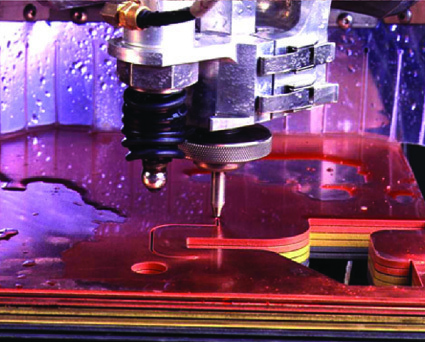 in water jet cutting does not lead to a significant measurement error, since the water jet reaches a process pressure of up to 6,000 bar, and a variable ambient pressure in the range of +/- 230 mbar does not cause any large measurement error (0.23/6,000*100% = 0.00383%). Due to the high risk of ingress of water and dirt, it is recommended that a “non-vented” housing is used, to avoid any ingress of water or dirt through an otherwise existing vent. Therefore, in this and similar cases it is advisable to use a non-vented relative/gauge pressure sensor.